Friday was really fun for two reasons, both of which are related, sort of. I took a really nice walk with a friend from high school who is in town for a while and we walked along the ocean front and out onto the wharf. Perfect timing because we got to see a pod of dolphins and a bunch of sea otters playing together! 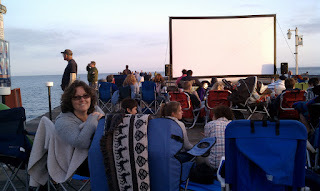 Then that evening we returned to the wharf with our kids and watched "Raiders of the Lost Ark" on a huge outdoor screen! It's a new summer time thing our town is trying and it was really fun. And, really, Harrison Ford on a large screen? As we watched the movie an almost full orange moon rose over the ocean. It's all good. Today we head off on our first "vacation" of the summer. My daughter and I are headed to Stanford University to attend a camp/class each. Digital Media Academy was founded by Stanford media educators, but they now do summer programs at about 10 universities around the country. I am doing digital photography and Photoshop while she will be doing acting and filmmaking (and learning Final Cut Pro for the editing). We go to our separate classes from 9:00 to 5:00 each day for a week and then we'll have the evening to swim at the hotel and tell each other all the stuff we've learned. I am REALLY looking forward to this! Our School Board met this week and we all expected to hear about getting our jobs back, but they didn't do anything about it. Perhaps at the next Board meeting on June 28. The good news is that classified workers (including the Library Assistants) got their jobs back! My reading goal this summer is that each week I'll read 100 pages in Shantaram, an adult book and a YA book. So far I am doing that and sometimes a little more so that is fun. Love those pictures! You are right - father's day makes me also think of when I was a kid. 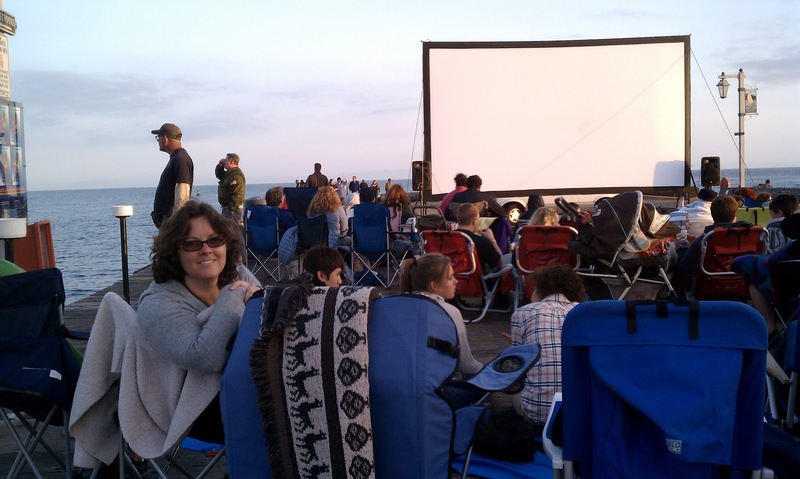 I love the outdoor screen experiment that your town was trying out - it can be so much fun!